Hi all! Iím Jennifer and I write for†Arcadian Home, a site that specializes in home decor and lighting trends from around the world.†I've been writing about home decor since graduating university and have loved it ever since. I'm addicted to patterned fabrics, Jonathan Adler, chaise lounges, old doors, milk glass jars, antiques, and chandeliers. There's no shortage of eye candy on Lucy Williams Interior Design†blog - her posts always include amazing inspirations that can spark new interior ideas. And I'm so excited to share a post on southern beach houses with her readers. Southern beach houses with well-thought-out interiors can make vacationing even better - having a wonderful second home that is not only homey but stylish too makes all the difference. Drawing inspiration from the sandy seaside, endless stretches of ocean and unique wildlife found under and above water, a southern beach house always looks stunning with organic colors, patterns, details, and even table decor. 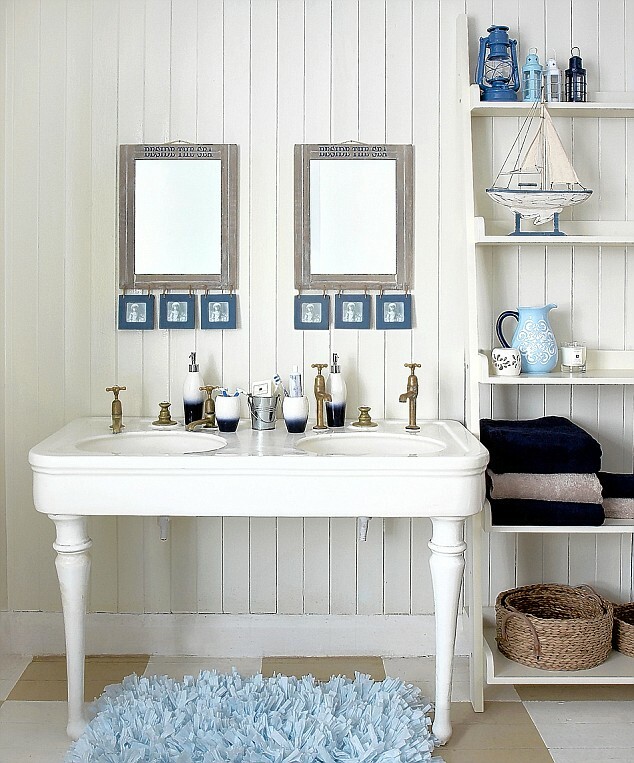 This calming bathroom, decked out in a blue and white sailing theme, is elegant and streamlined. The open double-sink vanity is perfect for guests. This mix-and-match casual sitting area has a number of unusual yet beachy items that look lovely grouped together, from the rattan table to the two-tone patterned couches, the framed maps and the contemporary lamps. The amount of textures and patterns in this laxed living room is incredible - stripes and solids, wood and rope-inspired furniture pieces, and the vintage tufted sofa and mod red bauble table lamp all come together beautifully. While most southern beach houses exude a more traditional feel, this modern space, with angled ceilings and skylights, is still keeping the beach theme with bamboo cubbies and a saltwater aquarium. Put head to pillow in an airy southern beach house bedroom with exposed white wood slat ceiling and floors, matching wall sconces, white canvas directors' chairs, and luxurious bedding. This beach house kitchen offers different working and eating stations not to mention an array of modern pendant lights and an inviting lattice-work window offering seaside views. A sunroom is the perfect addition to a southern beach house - the wood rocking chairs, wicker seating and telescope all take advantage of the breathtaking ocean sights. A casual den is infused with beachy elegance by showcasing organic pieces, like starfish and driftwood - hanging outdoor lanterns complete the look. Images 1 | 2 | 3 | 4 | 5 | 6 | 7 | 8 Which of these spaces do you love the most? Let us know in the comments below, and stop by our website for more lighting and interior inspirations! Sydney also use several sensible and handy painting suggestions for the interiors of any house. We will be discussing these types of ideas in this article.If you interested best home builders design regarding to interior so visit this(http://www.rockwall.com.au/) i hope so this is helpful. Thanks for sharing these lovely pictures. The ideas will surely help many readers in picking a décor and style for their homes to leave a long-term impression on the minds of guests and visitors. I love all the pictures! I really like the idea of painting wood paneling on the walls and ceiling white. In my past home I had the wood in my home painted with a clay paint and I really like the texture and look of it. If you have woods in your home you should definitely take advantage of them, they really make the rooms standout and make them unique. OMG!! this is like a dream!! everything is so perfect!! thank you for sharing those stunning pictures!! This is a great article. I love you interior design ideas in this pictures. I love coming across articles like this because it gives me new ideas for home improvements. I really would like to build a Spiral Staircase in my beach house that can connect my great room to the basement. The space is very small so a structure like this would fit perfect. Love the angled ceilings and skylights - now that kinda room would be in my dream home. And even though we run a carpet cleaning site Bissell ProHeat Review I'm sorry, but yes, we'd also go for wooden flooring throughout!